In designing a Business Continuity Management System (BCMS), you need to find or develop the right system that not only meets regulatory requirements, but also addresses each department in your company and the key components crucial to recovery. The debate over automation by using software for Business Continuity Planning (BCP) is typically focused on the perceived value of the system functionality. 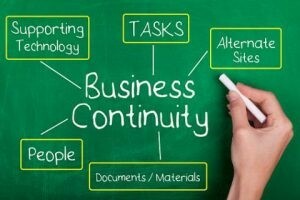 Business Continuity (BC) software has been around for several decades, and many improvements have been made. However, the increasing costs and risks associated with business disruptions have significantly heightened the need for effective BC management programs in recent years. BC software facilitates global data updates by cascading individual changes throughout the system. This marks a direct return on investment that increases as the system is configured to import from or link directly to external systems of record. Software allows data integration across modules. Many software systems have also evolved to include modules for business impact analysis, emergency notification, and incident management. Sharing the same database allows these software systems to support data sharing between plans, BIAs, emergency notification systems, and incident management tools. The latest versions of BC software have dramatically increased their level of continuity intelligence. Some vendors have developed planning tools that incorporate guidance based on current industry standards such as ISO 22301. The standard plan wizards / assistants / navigators include industry-specific methodology and allow for the further customization of end-user guidance. BC software facilitates responses to organizational changes. As organizations restructure, the storage functionality in most software packages enables plans to be relocated to reflect changes in business structure or geographical footprint. Plans can target the response and recovery of locations, business processes, applications, or network nodes. More importantly, if a current plans scope is to be divided across multiple plans, some software offers the ability to move a central component with all of its recovery details between plans. Evolving planning initiatives are accommodated more freely through software. The risks highlighted by events just over the last few years have renewed the industry focus on exposures associated with pandemics, nuclear energy production, and supply-chain resilience. Planning wizards / assistants / navigators can be updated to address these new initiatives and assigned to all or specific plans quickly. These planning tools can be enhanced to deliver instructional details for meeting new organizational guidelines and standards and to assist planners as they work to capture steps for addressing new threats. In the ever-changing business continuity landscape, this is critical. Software supports the creation of BC metrics. A relational database allows the creation of complex reports that summarize BC information across all plans. Management increasingly requires an enterprise-level view of the current state of preparedness in order to determine program direction. Manually gathering data from documents for the creation of metrics is a monumental task, and few organizations are staffed at levels that allow for the consistent and continual collection of the required information. In the absence of a database, the generation of metrics will be too infrequent to provide value. Additionally, if metrics data must be compiled manually, there is a much greater risk of error. Strategy development is hindered if there is a lack of confidence in the accuracy of data and its ability to be representative of the entire organization. Management may be reluctant or unwilling to act on the information. As a result, planners will view their work as less meaningful to the organization.